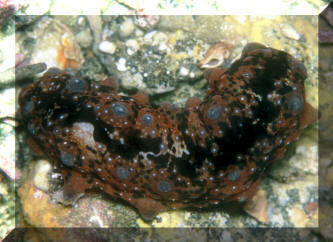 Pearsonthuria graeffei (Semper 1868), the Graffiti Sea Cucumber. Indo-Pacific; Red Sea to the Society Islands. Needs large tank space with gravel, rocks to continuously feed on. To twenty inches in length. A pic of the feeding/head end and the whole thing in Fiji. 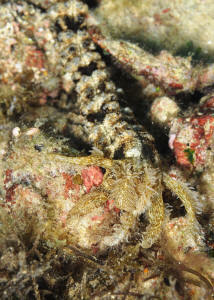 Stichopus horrens Selenka 1867, the Warty Sea Cucumber. Central and Eastern Pacific; Philippines, Fiji, Hawaii, Galapagos Islands. To twelve inches in length. A nocturnal species. Long, pointed tubercles during the night when it's out and about, knoblike during the day (shown). Highly variable in color. Galapagos pic. Stichopus cf. pseudohorrens Hawaiian Spiky Cucumber... needs description. Kona 2019. Synapta maculata (Chamisso & Eysenhardt 1821). Thin, up to 2 yards/meters in length. Found in sandy, shallow areas, often in fouled communities. East Africa, Red Sea to Society Islands. Fiji images at night. Synaptula lamperti Heding 1928. Opaque body with prominent dark longitudinal lines. 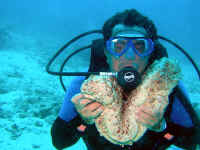 Found on, in large sponges. Western Pacific; Noumea, PNG, Micronesia, Philippines. 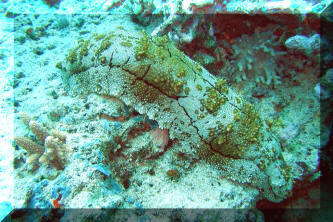 N. Sulawesi pix. 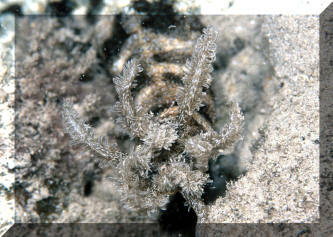 Synaptula species. Indo-Pacific; principally East Indies. Rarely kept in captivity though small (to about one foot maximum length) as it is always found in association with species of other invertebrates they stick to w/ small hooks. Images at right shot in Pulau Redang, Malaysia. Thelenota ananas (Jaefer 1833). To a half meter in length. Black bodied, with orange, conical papillae. Indo-West Pacific; Mauritius, Seychelles to Indonesia, Japan, Guam. N. Sulawesi pic. 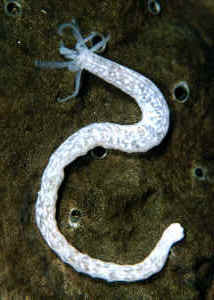 Thelenota anax Clark 1921. One of the largest Holothuroids at up to a meter in length. Creamy colored with orange blotches on back. From northern Madagascar to Australia, Fiji, Guam. Fiji images.